There are several well-known techniques. 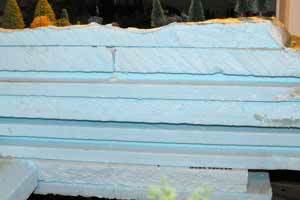 One involves piling blocks of styrofoam on top of each other and gluing them together with white glue or drywall caulking material. The sheets can be held together temporarily with wooden skewers and weighted with paint cans or whatever you have on hand. I prefer the blue construction styrofoam. Styrofoam is especially useful when you need to keep the scenery light, for example, on a module that needs to be moved. Then the styrofoam sheets can be shaped with a hot foam cutting tool or even a steak knife (one with a jagged sawtooth edge). Edges can be sanded and smoothed with a rasp. Some of the hills and mountains on my UNRR were roughly shaped with a steak knife and a rasp and then they were covered with Woodland Scenics plaster cloth (similar to the plaster cloth used for making casts for broken bones). Another method I have used is to make a lattice of cardboard strips held together with hot glue applied from a hot glue gun. One from a crafts store is all that is needed. Careful. Hot glue can burn your fingers and be quite uncomfortable. In the photo the cardboard lattice is viewed from underneath layout. 2" masonite strips protect the edges of the spline subroadbed for the track so that rolling stock doesn't hit the floor if derailed. 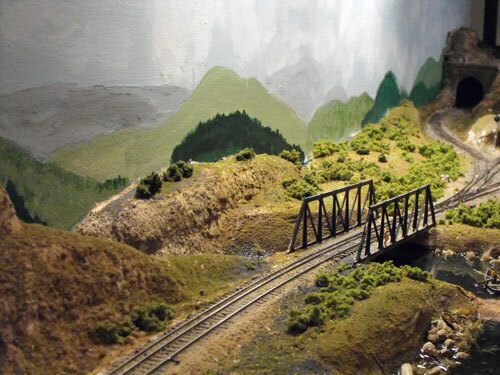 I have also used corrugated box cardboard for this and stapled or thumb tacked it to the sub roadbed. It only needs to rise about an inch above the track to be effective. The lattice is covered with industrial paper towels dipped in a soupy mixture of plaster such as hydrocal. Hydrocal is basically gypsum. This can be messy and it is wise to cover the floor beneath the layout with newspaper or a drop sheet to collect any wet plaster that falls through. 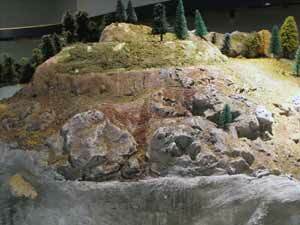 This can happen especially when making steep hillsides or cliffs. Industrial paper towels don't fall apart as easily as domestic paper towels. An alternative is to employ used dryer sheets like Bounce or Fleecy. These hold together better than towels cut or torn into pieces. They are also all the same size for overlapping and have straight edges that can help alongside the track to adhere to subroadbed. After the plaster had dried, the final contours were added with a longer drying plaster applied with a wide paint brush. The plaster should be like pancake batter in consistency or a little more soupy for the final coat. Dry pigments can be added to the dry plaster and the mixture can be sifted on and then sprayed with water. This is called "zip texturing" and was pioneered by Linn Westcott, John Armstrong and others many years ago. It is still an excellent technique. 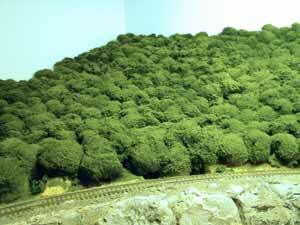 Hills made from wads of wet newspaper held down with masking tape and covered with "puff ball" trees. Another method that is better for simple hill contours is to wet and ball up wads of newspaper. These can be held down with masking tape. They are then covered with plaster cloth or the towel and dryer sheets. This is a quick and simple technique for making mountain scenery with gentle contours. It can be a lot faster and less messy than carving styrofoam. Draped industrial towels were used to make this mountain scenery. I use a glass rectangular Pyrex dish when making mountain scenery with plaster soaked industrial towels. It is easier to clean afterwards than plastic bowls. Some modellers prefer plastic bowls because they can be bent to pop out the old dried plaster. In either case the plaster inpregnated towels can be draped over the scenery. I had to make some nearly vertical cliffs around South Point and this was a messy and tricky job. The draped cliff can be seen in the rear of the photographed scene. 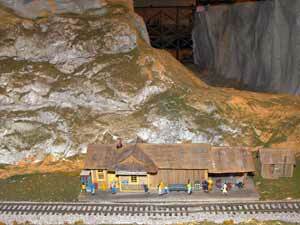 The area to the left, behind the station, used plaster cloth over styrofoam with hydrocal rock castings. Hydrocal sets up very quickly so you need to work in small batches. It is also difficult to carve. A layer of softer plaster or even drywall compound can be lathered on top and smoothed with an old paint brush and spatula. You can also use Sculpamold (which is similar to papier maché). I find it takes a long time to dry which is helpful when filling in gaps around castings. I prefer using hydrocal for rock castings. Plaster of Paris can also be used for castings. 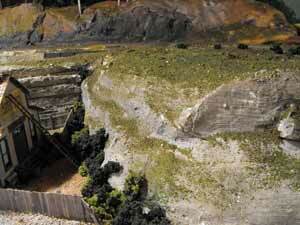 I recently used hydrocal to make a concrete pad for a travelling crane on our Nottawasaga Model Railway Club layout. Strips of wood were used to form a containment wall and the plaster was poured into the form and smoothed with a drywall trowel. An old set of railway trucks (wheels) with deep flanges was used to make the grooves alongside the rails before the plaster set up. Because hydrocal sets up so quickly the forms could be removed after about 30 minutes. Ceiling tile cliffs, styrofoam landforms and plaster castings. 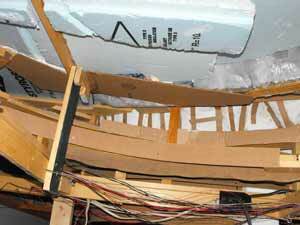 On the left of the photo behind the building I used ceiling tiles piled on edge and then rasped to roughen then up. On the right the landform was styrofoam with plaster cloth.The background hills used wads of newspaper and plaster soaked paper towels. A second coating of plaster was brushed on before ground foam was added. I always spray the plaster with thin coats of black Rit dye in water to build up some colour and bring out highlights. Or you can use the landscape fluids sold by Woodland Scenics or a little india ink in alcohol mixture. Rit dye seems to have salt in it so it can affect the setting up of the plaster, or so I have been told. I've never had a problem. The important thing is to build up the layers slowly. It is easy to add more colour and hard to lighten it if you go too far too fast. Some modellers mix black pigment into the plaster or even mix in gray or black paint. This is so white plaster doesn't show through if the plaster is chipped. A little bleach can be dribbled down crevices for an interesting effect. Use an eye dropper to control the amount. A scene using most of the above techniques. On the following pages I cover a number of techniques I've picked up over the years. Click on the links. Try the ones you like. Ignore the rest. In no time at all you'll have developed your skill level and have a bunch of methods that are your favorites that you can share with other modellers. An experiment in painting a mountain backdrop. Making pine trees with air fern branches. Woodland Scenics metal trunk pine trees with stretchable foliage. How to disguise a top-mounted switch machine. A chainlink fence acts as a scenic divider. "Kitbashing" a Woodland Scenics cemetery kit. Return from "mountain scenery" to my Home Page. Absolutely the best site-building program around. Take a few minutes to check out these stories by other SBIers by clicking on Case Studies. You won't be disappointed.